Karim Chan won a gold medal in the long jump. 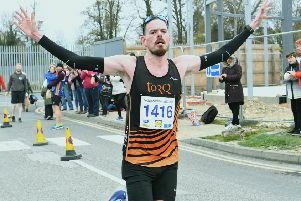 A Peterborough athlete struck gold at the National Disability Championships at Warwick University at the weekend. Karim Chan, a 14 year-old Marshfields School pupil represented the Eastern region in the 100m and long jump and, although almost a metre below his best, he took first place in the latter with a leap of 5.18m. In the 100m Karim set a new personal best of 12.6 in his heat, which was the fastest time of the day, and eased through the semi-finals in 12.9 to make the final. But along the way he picked up an injury and just missed out on a medal in the final. Chan, who first took up athletics 18 months ago, is a member of the Nene Valley Harriers Special Needs Club run by Ian Nolan.